The 97,000lb thrust engine, which will exclusively power the Airbus A350-1000, builds on the success of the 84,000lb thrust version of the Trent XWB which recently celebrated reaching one million flying hours while achieving the best ever widebody entry into service performance. While there is very little visible or operational difference between the two Trent XWB engines, the higher thrust version employs a range of advanced technologies to produce extra thrust and optimum aircraft performance. The front fan has the same number of blades and is the same diameter, at 118 inches, but will run around six per cent faster. The engine core has been scaled up in size to cope with the consequential increased airflow into the compressor and the combustor and turbines will both run at higher temperatures. The engine also features new materials and coatings for the high-pressure turbine blades as well as an intelligent cooling system to ensure expected performance and efficiency can be delivered at the higher temperatures generated within the turbine. 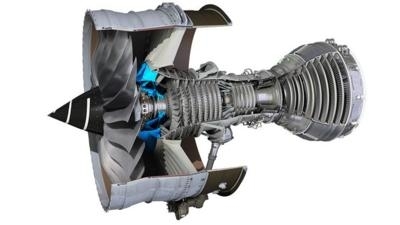 The Trent XWB-97 will be the second new Rolls-Royce widebody engine to enter into service in less than two months after the Trent 1000 TEN took to the skies at the end of last year powering the Boeing 787 Dreamliner. A third new engine, the Trent 7000, is also set to enter into service later this year.